Toasted hazelnut butter for the Local Thirty is smooth, nutty, and has a touch of sweetness from some honey. Taylor and I were both pretty nervous about living without peanut butter for an entire month. We both have a soft spot for peanut butter toast and we were pretty bummed that we’d by saying goodbye to one of our favorite comfort foods for 30 days. 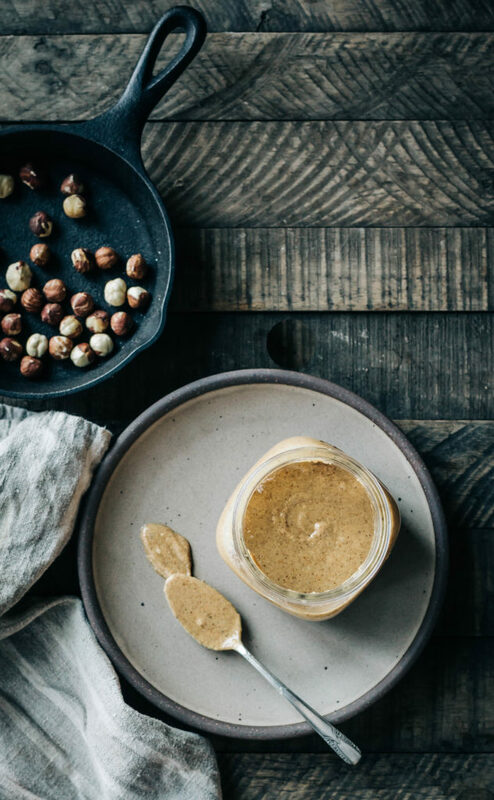 Luckily, we were able to find some hazelnuts grown just down the road from Tumbleweed Farm and this nut butter is our new favorite spread. We were able to get through September pretty easily with this local swap and now that I know how simple this is to whip up, we’re going to continue to make this weekly even after our Local Thirty month is over. It’s absolutely divine, and I hope you all enjoy it as much as we do. If hazelnuts aren’t available in your neck of the woods try another nut or even try making a seed butter (sunflower, pumpkin etc.) the flavor will be different but I’m sure still wonderful. Preheat the oven to 350F. Add hazelnuts to a cast iron pan or baking sheet in a single layer. Toast the hazelnuts until fragrant and golden brown. About 10-12 minutes. Remove from the oven and let cool slightly. When cool enough to handle, pour the nuts out onto a large kitchen towel and use your hands to roll the nuts around to remove most of the skins (this will result in a creamier nut butter) you don't have to be perfect here, but the more skins you get off the better. Leaving excess skin behind scoop the hazelnuts into the bowl of a food processor. Blend the nuts until they become creamy, this will take about 7 minutes so be patient! Stop to scrape down the sides as needed. Once the nut butter is creamy, add the salt, honey and cinnamon if using. Continue to blend until well incorporated. Taste for seasonings and adjust as needed. The longer you blend the nuts the runnier to consistency will be. I like my nut butter in that sweet spot of thick, yet still drizzle-able. It's preference at this point. Store the nut butter in a mason jar at keep at room temperature for up to three weeks. Or you can store the nut butter in the fridge for up to 3 months. I’ve made my own peanut butter, almond butter, coconut butter, and tahini. This makes me wish I liked hazelnuts, but in my old age, they have become one of the flavors I don’t care much for. Nut butters are easy to make, and they will smooth out and become rather runny, if one is patient. Peanuts, which are rather soft, are the easiest place to start when making your own nut butter.